I keep looking at the chart to see if there is something bright to write about but nothing, at least nothing of any real significance. There are some signs that things might be getting brighter but they would be signs mostly in my mind rather than anything concrete. I guess the most positive action one can grab on to is the fact that once the Index fell below that “box” that it was in for so long, that the Index hasn't yet dropped like a rock, as might have been expected. I'm hoping things do perk up soon because as long as things remain bearish readers start to lose interest and sooner or later I'll end up writing these commentaries only for myself. Back to the real world. 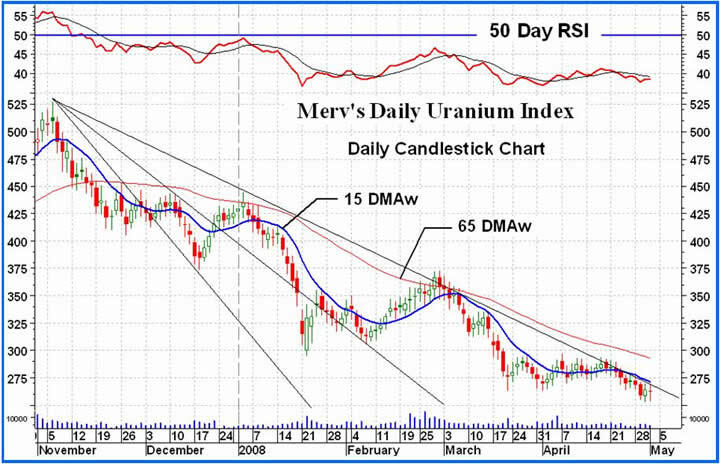 The Merv's Daily Uranium Index closed on the down side again although not by any great amount. It lost 0.59 points or 0.22%. There were 24 winners and 21 losers (hey, there is another plus to grab on to, more winners). As for unchanged, there were 5. Of the five largest stocks Cameco gained 0.7%, Denison lost 2.1%, First Uranium lost 0.5%, Paladin gained 1.2% and Uranium One lost 1.7%. The best daily performer was Fronteer Development with a gain of 10.2% while the worst performer was Pele Mountain with a loss of 26.8%. The third FAN trend line was drawn from the November high through the top of the second trading day of the year. Since then it has trapped the subsequent action quite well. Even now the Index has a rough time trying to break on the up side in a decisive manner. For a new bull move to take hold there are two pre-requisites to watch. A break above the third FAN trend line and a break above that upper resistance “box” line, which was at the 297 level. Until then any moves may be short lived. Of course, at this time it is impossible to say that if the Index should break those barriers that we would actually be in a bull market but we can't get into one without those barriers being broken. In the end we'll just have to watch the charts and indicators and go with what they tell us, or more precisely, with what I think they might be telling us. As nothing has happened to change the analysis from yesterday I'll just cut to the chase and summarize that the intermediate and short term ratings are still BEARISH . For details, see yesterday's comment. Hopefully tomorrow will bring us some better news. May 3, 2008: In 1996 my late husband invested $5,500 in Canadian Oil Sands Trust. I said "be realistic there is sufficient oil around so why would squeezing it out of sand be necessary" That $5,500 is now worth $90,000 (with splits etc) and I received $8,000 income per year. I mentioned to my son that I had purchased 6 inexpensive uranium stocks, he said "Mother be realistic, it will be years and years before any profits will be forthcoming"
My reply was "within 3 years or less, the price of uranium will be at $100 or more per lb. and if I go to my"great reward"before then, you will be sitting in your Mercedes and silently thanking me"
Uranium will be the energy source of the coming years. It does not harm the atmosphere and I wouldn't be surprised if they will be able to use it for 50% of the world's energy needs. "Let A Word To The Wise Be Sufficient."